Buick officially took the wraps of its 2011 Regal at the LA Auto Show, and in addition to showing off its sportier side, General Motors' reborn Lexus competitor confirmed its intentions to produce a compact sedan - and here's the first rendering. Likely based on the Chinese market 2011 Buick Excelle XT (a rebadged Opel Astra with an upmarket interior), the new compact four-door is expected to lose its hatch in favor of a traditional trunk and gain a 181 horsepower, 1.6-liter turbocharged four-cylinder mated to a six-speed gearbox. The sketch above (flashed on screen during the Regal unveiling here in LA) certainly bears a resemblance to the Excelle and to the larger LaCrosse, although a few tweaks to the fascia, headlamps and the addition of a few hood-mounted portholes could be found on the concept and later, the production model. We should know more later this year, when Buick unveils an official design study followed by the eventual production car that is expected by the end of 2010. 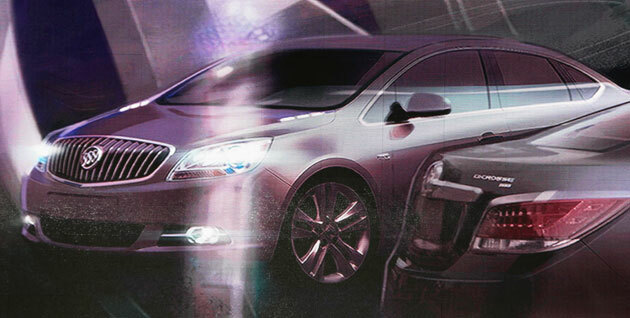 LA 2009: Buick rendering teases new compact sedan originally appeared on Autoblog on Thu, 03 Dec 2009 14:28:00 EST. Please see our terms for use of feeds.